Today I found this item from 20 years ago. You may not know, but I began my career as a stamp dealer selling post - 1991 New Issues of the ex-Soviet Republics. I filed my first tax return as a dealer in 1993 - 94 having originally got involved with these issues as a collector. 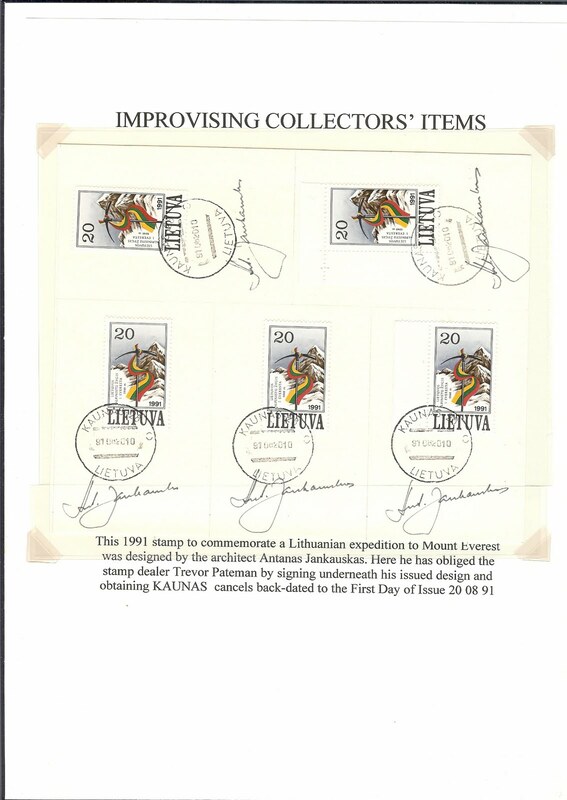 From early on, I was always looking for something a bit different: commercial mail, local issues, proofs, curiosities - like this item which Antanas Jankauskas supplied. Most of these sheets I cut up into small, individual cards and sold for a few pounds each. This one is in its original form and I obviously wrote it up at the time for a Club display. 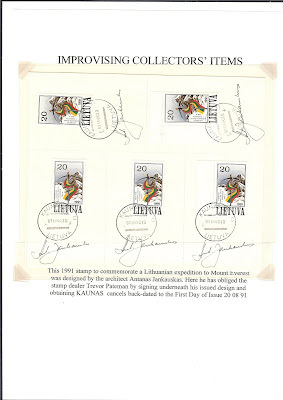 Antanas Jankauskas also designed at least one of the first post-1991 Lithuanian postal stationeries. My biggest success was probably the commercial mail I got from a few factories and offices. But I also got things like Azerbaijan imperforates, produced in very small quantities (100 - 300) by DSR Holdings / La Poste. I also tried very hard to get authentic local issues though even at the time I realised that getting a stamp through the post, even on a Registered letter, did not mean very much. The important thing was to find the stamps used on commercial mail both internal and going abroad. For Ukraine, this could be done quite easily. Genuine local issues for Russia were much more elusive and I don't now know how many there were - there must be specialists who do. I gave up on the New Issues business some time in the 1990s as more and more absurd Fantasy material poured onto the market. It seemed that half the population of the former USSR was involved in the industry. I still have left-over material like the item illustrated above and quite a lot of commercial mail, but I don't do very much with it. My mail box nowadays is much less colourful than it was in the 1990s. It is not only ex-Soviet Republics that are now issuing fantasy stamps. Even the very serious France post office is now issuing junk: many collector sheets that sells OVER the face value...so no one in their right mind is going to actually use them as postage. In 2010 buying all the new issues (excluding marianne booklets) was close to 500 euros. So I no longer collect France. Even used it is now impossible du to all these junk stamps. Russia's 1990s Inflation - a Catch 22 cover?